Coming from a big-small town such as Duluth, I’m used to seeing housing on a spectrum. The variations are almost limitless: big house, little house, apartment, duplex, big yard, a patch of grass before the sidewalk, etc. I was lucky enough to be raised in a mix of it all: moving from a small house in Duluth’s Central Hillside to a beautiful home in the Woodland neighborhood and again back to the Hillside to a dinky, albeit beloved, apartment with a list of ailments longer than its luxuries. No matter where I’ve lived, I’ve always marveled at the ability to make any space “home”, and that the exterior of any building can be deceiving. 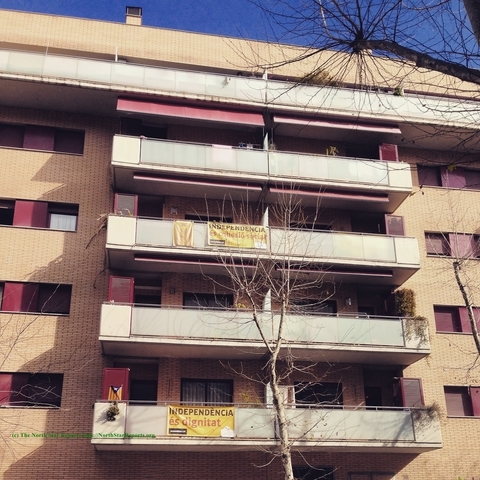 Here in the little-big city of Barcelona space is limited, so for the 1.6 million some people who live here home is an apartment, or “piso”. Apartment buildings are nestled alongside and above businesses so city blocks are a hodge-podge of different colors, shapes, styles and doorways. Buildings are seemingly built up and torn down at will, currently a cafe I had visited only 3 weeks ago is being torn up (quite literally as it seems they’ve even torn up the foundation??) and remodeled, and storefronts are flipped in a matter of days. While the restaurants and storefronts are constantly changing, there is one architectural feature that won’t be going anywhere anytime soon. Walking down the streets your eyes are drawn up to the sky thanks to balconies decorated with plants, furniture, and of course flags. No matter how cheap (relatively speaking, mind you, rent in Barcelona is exorbitant compared to what I’m used to!) or pricey, every apartment seems to have this one obligatory amenity. Back to the flags: I say “of course” because Catalonia is one autonomous region that wants its independence, and the proof is in the pennants. 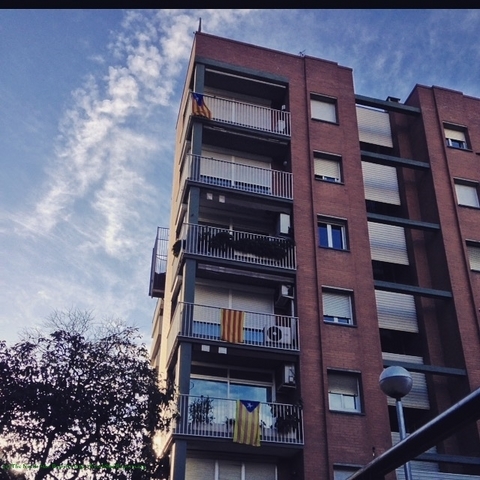 One of the first days of class, one professor told us to mind the balconies, that there were three kinds; those with the Spanish flag, those with the Catalonian flag, and those with no flags at all. 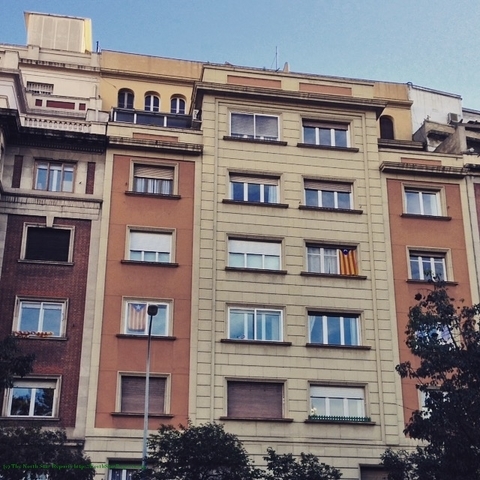 I can tell you now that the balconies bearing the Catalonian flag are the most visible, closely followed by those with no flag at all. Within the next few weeks I’ll be writing at least one post that goes into further detail about the Catalonian Independence movement to give you all a bit more context, but right now as I type it is Fat Tuesday, the last day of Carnaval, so I’m off to Sitges to see what it’s all about! Hope all is going awesome over there. A question I have is whether or not Barcelona is a huge city in and of itself or is there suburb type places as well? I ask because of how you described the city. Anyway, that is amazing how fast things seem to change there, here it takes forever. Anyway safe travels. Hi Mike! Yes, like most big cities Barcelona has many suburbs, and there are an abundance of people who commute every day to work or go to school. I fancy it kindof like the Twin Cities in that sense. I agree, the speed with which everything here changes can make your head spin it seems so fast! It’s great to hear about your experience of a different culture while you are down there. Even though you are miles away I am sure Barcelona will remain as sort of a short period “home” like you described in the beginning of your article. Best of wishes to you! It’s interesting seeing how something as little as having a flag hanging from your balcony can have so much meaning and importance to certain cultures. If a tourist were to wander around the city they wouldn’t think much of it. It just goes to show how different cultures value different things and place more importance on certain items in their lives. I love your description of the busy bustling streets with all different kinds of people around. I’ve always wanted to experience that kind of environment. I’m curious about how the people feel about the constant change in the storefronts that you talked about. Does it bother them to always have things changing? I’m not sure how I would handle all of that. Thanks for another great read! Hi Kaitlyn! I wasn’t quite sure how to answer your question by myself so I asked my host-mom since she’s been here 15years and has a better understanding. From what she told me, yes it’s a bit frustrating to the people here to have stores in construction, similarly to how in Duluth we’re almost constantly irritated with road construction. What she mentioned, though, is that the neighborhood bars and restaurants rarely update because there is no money (Spain right now is still in a bit of an economic crisis, although hopefully in the upswing!) but still in the stores and such, the modifications that occur can be a bit tiresome. Hope that clarifies a bit! I really like all the photos of the buildings you presented in your article. This reminded me of the building exercise I did for Professor Liang’s class. All the buildings in your photos looked very unique from one another and designed differently. To which, I believe makes them unique to the community and country too. From my perspective, I would not see any buildings in the U.S. that would look identical to those buildings. Furthermore, the architecture in the U.S. is different and revolves more on American culture. So it was interesting to see how the architecture is like in Barcelona. Bao, your comments are always astute! The architecture here is certainly unique, but moreso I would describe it as old-worldly. Many residential buildings that I photographed are older buildings that have been renovated little. The plus side of this is that the apartments are gorgeous- with high ceilings and balconies and small details here and there, but the unfortunate end is that there are some sacrifices when it comes to accessibility, i.e. the elevators (in the newer buildings that have them) routinely have issues. All in all, I love the way all the different styles come together to build this city! I think it’s awesome that you have learned the ability to make any dwelling feel like home, I am not sure that I can do that myself. Also, I hope you post more about your Carnival experience, I bet it was awesome! I know you said you would go in to more detail in your upcoming article on the Catalonian Independence movement. But how much though do you think has gone into the movement? Do they have a plan for the new government or are they just using independence as a threat to gain more rights in their current position? Any way I hope you enjoyed Mardi Gras, now that its halfway through Friday, are they serving meat over there today? Katy, from my current studies it seems like a lot has gone into the movement; the language, culture, a shared history, a sense of need for sovereignty and the ability to control their own money (Catalonia is one of the most wealthy autonomous communities and their fiscal deficit is almost double the norm found around Europe). As far as the ideals in place to govern themselves, yes they have a plan. I need a bit more information myself in order to relate it back to you but from what I understand Catalonia feels they could better benefit from being their own country in the EU / or closer to a federal state of Spain and there is no shortage of support for this idea. In my hometown I haven’t had the luxury you have had of seeing all the types of housing. I do like the photos you have included in your article because i have never scene houses from a different country and i like to compare them to housing here. I hope all is well! I’m interested in learning more about the different flags that are flown off balconies and in windows. 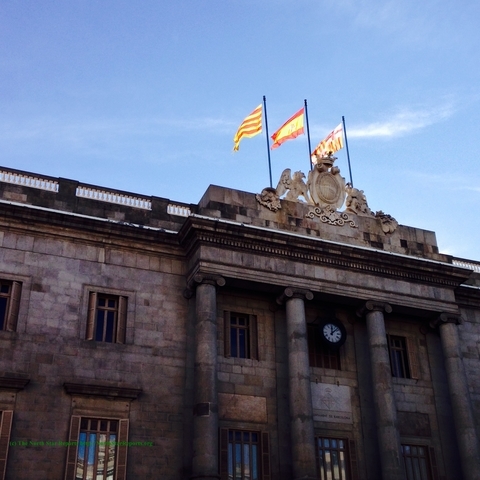 I know that there is a fight for independence in Catalonia, but are there any repercussions for flying their flag in lieu of the Spanish flag? I’ve also noticed what you said about a building’s exterior being deceptive here in Duluth, since I’ve been looking at apartments for next year, and a lot of nice looking buildings have dumpy apartments and vice versa. I’m looking forward to reading more about your adventures! Becca, the curb appeal of an apartment I’ve learned is practically useless! Unless one is looking to invest in a home to resell, what a building looks like on the exterior is hardly relevant, ha! With the flags, I can’t say that there are any governmental repercussions seeing as Catalonia is it’s own autonomous community, but as far as the grand scheme of things there is a lot of tension between the populations of Catalonia and the rest of Spain. There seems to be a dichotomy between being Spanish (i.e. from Madrid, or for the continued union of all of Spain) and being Catalonian (wanting your independence, rupturing the current system of autonomous communities). For a long time politicians have used this tension to their benefit, playing off the other as a sort of scape goat for governmental issues, but the people are getting sick of it and right now Spain is in another sort of transitory stage. This fall there will be elections, and I’d urge everyone to keep an eye/ear out for the results! I feel that the small space most people occupy when living in a large city would be the biggest adjustment for me as I’m use to living where there is as the Dixie Chicks profoundly sang, “wide open spaces.” My grandmas farm is over 150 acres and I consider Duluth a big city. However as you said people easily adapt to their circumstances and surroundings. Austin can I start by saying I’m loving the Dixie Chicks reference? As far as adjustment, people choose their spaces based on their preference. If big city livin’ doesn’t appeal to you there is no problem with that! As for me, Barcelona is perhaps the biggest city I’d like to live in. Places like New York are exciting to visit, but I get a bit anxious when there is always someone on every side of me, I need my ‘wide open spaces’ just as well, and thankfully Barcelona has a bit of both to offer! I look forward to your post talking more about the flags, as I have been learning about independence movements throughout Europe in class this semester! Your pictures are great, and thanks for sharing! Cool article and great photos! It really helps capture different perceptions of space and how those spaces are utilized. This is a great start to your adventure there and learning of the independence. I bet it is beautiful to see all the different buildings in an area and to see how some are decorated. I’m interested to see what else you learn there! That’s a neat observation on the symbols that help construct national identity. I wonder if other regions of the world who call for their independence have a popular display of flags as well. I enjoy reading your posts! Thank you for providing us with a first hand look into Barcelona! I like this article on how you perceived your experience so far in Barcelona. I am interested to see how your life has been when you are there and the experiences you have had. I am looking forward to future posts. Thank you for sharing! I enjoy reading all of your posts! I too like architecture and flags! My favorite flag is the Colorado flag for some reason. Keep being you and I look forward to your next post! “and that the exterior of any building can be deceiving” This is one thing that I came to realize after quite a while. I really found the flags quite interesting, and I am led to believe that the flags are actually meant to send out a message to passer-bys. “No matter where I’ve lived, I’ve always marveled at the ability to make any space “home”, and that the exterior of any building can be deceiving.” I especially liked this quote from your writing above. Coming from a small town myself and into college, it has always surprised me at how much I have grown to find college a second home. I think it is amazing how different a place can be just an airplane ride away. I also came from a small town and now here in Duluth I like the change of the small town to the big town. Its fun to meet new people almost everyday. But Im not going to lie I do miss my small town and the feeling of it. It’s interesting to hear about how architecture differs throughout cultures both physically and by what it means to people. I especially found your description of the constant tearing down and building up of building interesting. In the United States, many people probably wouldn’t like this, while in Barcelona it seems to be a normal occurrence. I’m echoing a few past comments, but I’m looking forward to your article about flags. I urge you to make a strong connection between nationalism and flags as symbols of the movement. Additionally, I’m curious about what groups, if any, recognize the flags. Love the pictures and your description about making any place “home”. As many others have noted, I am also looking forward to a post about the flags and the independence movement. I have learned a small bit about the Catalonia independence movement and how it would be equivalent to a Hawaiian independence movement in the United States e to differences in culture. Their movement for independence is also similar to the Scottish vote of independence from the United Kingdom. One last thought, I think it is amazing that based on flags, we can tell there is a movement going on or a wanting of something more. I really enjoyed all the picture in your article and also how you described it has home. You can tell from your photos and also in your article that a movement is going to happen and it will happen sooner than later.